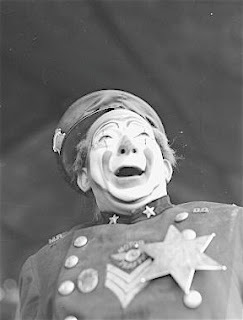 A performer who clowned in virtually every possible venue during his long and distinguished career, clown cop Jojo Lewis. 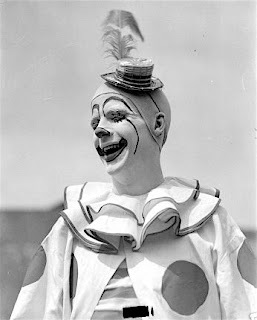 The classic grotesque American circus whiteface makeup and costume of Felix B. Adler. 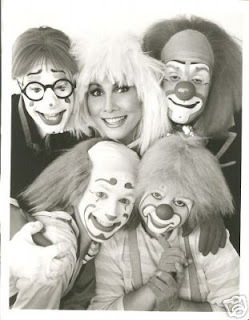 From Germany, one of the all-time great circus comedy knockabout acts, the 6 Gutis (or Guttis) on the Ed Sullivan Show. The Gutis are introduced by Scampy from the television show Super Circus who was played by Sandy Dobritch, son of ace circus producer Al Dobritch. The classic Firehouse Gag (as produced by Paul Jung) and presented by the Ringling Bros. and Barnum & Bailey Clown Alley of 1965 with the assistance of famed vaudeville clown, Ed Wynn. Lou Jacobs plays the bomb-throwing anarchist (and then possibly goes inside to work the lycapodium); Marcos Drougett may be the cop. The first person out of the house might be Mike Padilla, then Albert White and lastly Dennis Stevens. The group of firemen include Duane "Uncle Soapy" Thorpe, Glen "Kinko" Sunberry, Gene Lewis, Paul Wenzel, Prince Paul, Mike Coco and Kochmaski and a few guys without makeup which leads me to believe that some of the older folks in the Alley needed a little help catching those guys in the net. Paul Jerome in whiteface with a hat that harkens back to Slivers Oakley, a jacket that suggests Al Shean (of Gallagher and Shean) and a pair of shoes that look... well, that look like no other pair of clown shoes that I've ever seen! 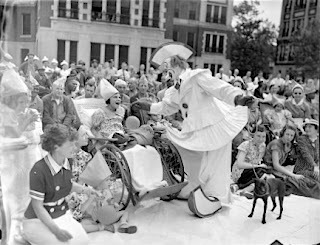 The photo looks to have been taken at the annual show that Ringling used to do for the children of Bellvue Hospital in NYC during the Garden engagement. Looks to me like a photo of a young Harry Dann in the mid-40s. Knots Landing star Michele Lee with (clockwise from bottom left) Christopher Hudert, Adam Auslander, Ron "Toto" Johnson and Rene Coker. The Pompoff Thedy Family perform their classic entree for television in the mid 60s on Hollywood Palace, introduced by Donald (The Buster Keaton Story) O'Connor. Michael "Coco" Poliakovs, Freddie Freeman and Marcos Drougett performing the Levitation Gag on the 95th edition of the Ringling Bros. and Barnum & Bailey show as seen in the 1965 television special HIGHLIGHTS FROM THE GREATEST SHOW ON EARTH. >I have be enjoying you photo gallery. I just scanned some old photos that I have to share. Each pictures name is the >description of the photo. I will be sending you more later. 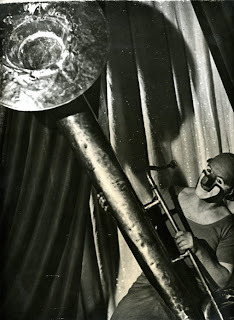 The zany British musical troupe The Nitwits (the predecessor to Nuts & Bolts, who worked Circus Roncalli as well as Barnum's Kaleidoscape), regular performers at the Stardust Hotel in Las Vegas as well as venues around the world. Here they are on Hollywood Palace being introduced by Bing Crosby. The ensemble made its debut in 1937 at the Paramount cinema in Tottenham Court Road. As the war approached, they took up residency at one of London's most prestigious venues, the Café Anglais in Leicester Square. Then, like many in showbusiness, they did their bit to boost troops' morale as part of Ensa, (the Entertainments National Service Association). Their career continued to flourish in postwar Britain. They performed at the Albert Hall, played with Ronnie Scott and Kenny Baker, and were introduced to an even wider audience by the radio show Ignorance is Bliss. By the late Forties, they were, by all accounts, major stars in the UK but the writing was on the wall by 1960, when they worked the summer season in Blackpool, playing second fiddle to bill-toppers Alma Cogan and Tommy Steele. Times were becoming tough for acts like the Nitwits, according to Max Tyler, a historian for the British Music Hall Society. "During the Sixties, variety finally died," he says. "Television meant that people no longer had to go out on a wet night for their entertainment. There wasn't regular employment for performers such as the Nitwits at home, so they looked around to see if there was work abroad." They found lucrative employment at the Paris Lido, which was, in musicians' parlance, a good gig. The big breakthrough came when the show – undoubtedly better known for the dancing girls than the Nitwits's act – was shipped to the Stardust in Las Vegas in February 1962. The Stardust, built in 1958, was, even by American standards, pretty outrageous. It boasted the largest electric sign in the world. With 7,100 ft of neon tubing and 11,000 lamps, it could be seen 60 miles away on a clear night. The stage facilities were regarded as the best in Vegas as no expense was spared on the theatre or the acts they brought in to fill it. The Nitwits performed at the Stardust for several seasons, and the act went over big as they brought the show to a close each night. Reviews neatly stored at the University of Nevada show that critics enjoyed the work of the "10 wonderful, nonsensical, motley musical entertainers", as one reviewer described them in 1962. "We were just a bunch of old farts, a typical raggedy arsed band," recalls Brian Firth, now 72, in a Lancastrian accent undimmed by more than three decades living on the edge of the Nevada desert. He joined the band in 1967, succeeding Harry Cole as trumpeter and spent six weeks at the London Palladium, supporting Tom Jones. But the Nitwits' return to a home stage was a short one. "There just wasn't the work in Britain," says Firth. "So we spent three months in Teheran, working in the biggest brothel in the world – a square mile of solid brothel. It was a very long three months." The Six Day War cut that engagement short, so the Nitwits went back on the road in Europe, before returning to Vegas once more. A projectionist at the Stardust filmed the act on a hand-held movie camera. The jerky footage, which Firth has kept on videotape, is possibly the last surviving recording of the Nitwits. By then, Sid Millward, who had suffered several heart attacks, had been told to give up the clarinet. He became, instead, the conductor of his unruly act. He wandered around the stage in tails and spats, waving a baton around rather pointlessly. This gave him a chance to witness some of the stunts the band had been pulling for years, behind his back. "It really creased him up," Firth says. The Nitwits settled in Vegas and lived; the act was generously rewarded by the casino bosses. But the punishing schedule took its toll and new recruits were found as needed. Ringling Bros. and Barnum & Bailey Circus Master Clown Lou Jacobs' (1903-1992) video bio from his 1989 induction into the International Clown Hall of Fame. 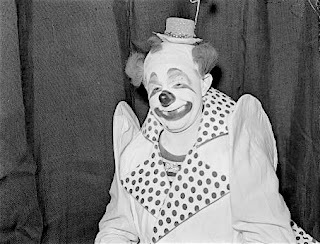 Lou Jacobs performing his classic Baby Buggy Gag in 1965 on the annual HIGHLIGHTS FROM THE GREATEST SHOW ON EARTH television special, that year hosted by another famous clown, Ed Wynn. Lou Jacobs and Jimmy Briscoe at the 4th annual Festival International du Cirque de Monte Carlo where Lou was given the Lifetime Achievement Award. In my opinion, one of the funniest performers in history and one of the best musical comedy acts of all time: Johnny Puleo and the Harmonica Rascals (later the Harmonica Gang). Here we see Johnny and the Rascals in a 1949 appearance with Milton Berle on Texaco Star Theater. David Shiner street performing somewhere during the late 80s/early 90s for a German television special. Another great publicity still from Charlie Rivels' 1943 film AKROBAT SCHOOOON!